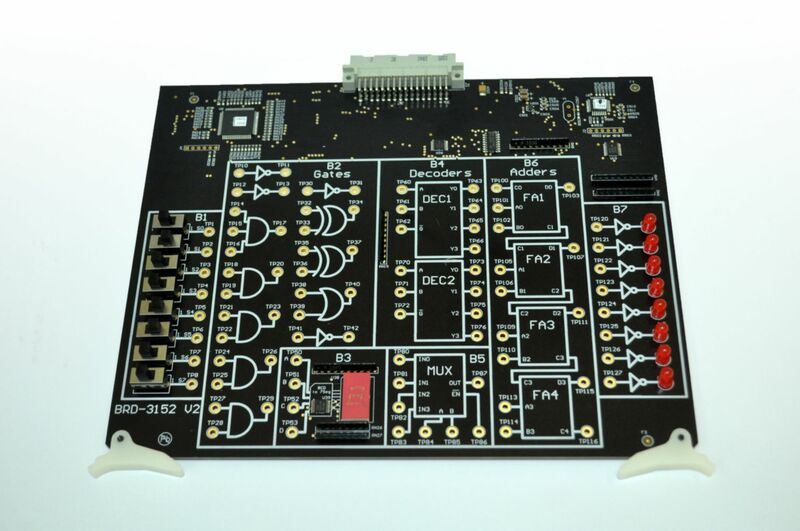 The Multiplexers, Decoders, and Adders Board is a comprehensive instructional module that plugs directly into the Electronics Universal Training System base unit designed to teach the fundamental concepts of various decoders, creating a logic function with a decoder, multiplexers, and their use in implanting logic functions, and binary arithmetic implementation to students who are both beginners and experts alike. The topics covered on this board include: constructing a decoder, IC decoders, using a decoder to implement a function, multiplexers, implement functions with a multiplexer, and troubleshooting exercises. A minimal amount of wiring is required to setup the board, increasing the amount of time students have for hands on learning. The fault insertion system allows you to create an error on the board for students to troubleshoot, further developing their diagnostic skills. By creating, testing, and performing experiments from the included manual, students will learn the theory, practical applications, and gain a working knowledge of the fundamental concepts of multiplexers, decoders, and adders.